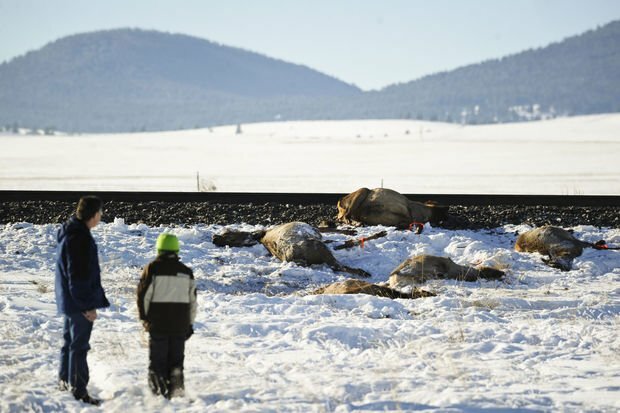 In a devastating scene in the Montana backcountry, a herd of 23 elk were wiped out by a train locomotive. No one was hurt in the accident, but the majority of the elk parts were beyond recognizable. There is a reason the front end of a train locomotives are commonly called a cow catcher. Collisions between trains and animals are not uncommon. But taking out nearly two dozen animals at one time is really something tragic. The collision occurred just outside Helena at around 9:30 pm Dec 31. Game warden Dave Loewen supposed to Montana Public Radio how the accident happened. “There’s a lot of the snow in the area and so what happens is the elk will be crossing from one side of the tracks to the other. When they get up on the tracks they kind of take a break because there’s little snow up there,” he said. Unfortunately none of the meat was salvage for human consumption, he said.